ARCHAEOLOGISTS from WA’s Aboriginal affairs department dug one small hole to a depth of 20cm to determine no artefacts at a sprawling heritage site were in the way of the Perth Freight Link. Experts say at least 10 to 20 test holes should have been dug, to a depth of a metre. The site, between Bibra and North Lakes, had previously been found to have more than 2000 artefacts indicating human presence back to the ice age, with several reports suggesting more could be buried. The archaeologists’ swift visit was part of a controversial second bite at the cherry by the department after one of its committees recommended not allowing Main Roads to disturb the site. The advice from the archaeologists was critical to the committee overturning its own advice, Aboriginal affairs minister Peter Collier told parliament in response to questions from Greens MLC Lynn MacLaren last week. Mr Collier says he was unaware of the earlier recommendation for refusal, despite the minutes of the committee saying a briefing note would be sent to his office. The archaeologists confirmed previous surveys of the area had found no surface artefacts remained following the construction of Hope Road. UWA research fellow Joe Dortch, the vice-president of the WA chapter of the Australian Association of Consulting Archaeologists, says digging one small hole is “not an adequate investigation”. “You are not going to find a lot in one spot,” Professor Dortch told the Herald. He says for a site of that size at least 10 to 20 test holes—each going down at least a metre—should have been dug, using well-established method known worldwide as shovel-pitting. Prof Dortch wonders whether only one hole was dug so the department could avoid a more substantial dig which would have required approvals from traditional owners. That can be a lengthy process. He says disturbing the artefact site shouldn’t be a big deal if it’s adequately recorded, but he is scathing of Mr Collier’s decision to allow Main Roads to destroy a nearby mythological site. North and Bibra lakes are said by Noongars to be where two Waugyls, or rainbow serpents, rested after creating the Swan River and the extensive chain of swamps that once ran from Mandurah to the northern suburbs. 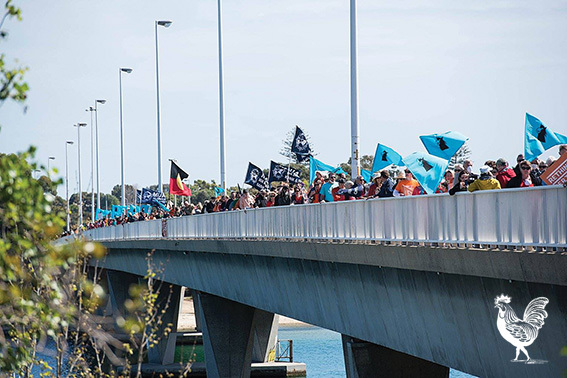 This mythological connection is behind the South West Aboriginal Land and Sea Council’s opposition to the Roe 8 extension. Prof Dortch points out the Barnett government has been happy to promote SWALSC as the area’s traditional owners—even negotiating a billion-dollar native title agreement—but snubbed it in the latest round of consultation over the project. SWALSC’S acting CEO Wayne Nannup is also furious Main Roads has been claiming support from traditional owners, given his members are in unanimous opposition. “There are no amounts of conditions or measures that can mitigate the loss of significant heritage and spiritual connection of the Coolbellup and Walliabup area wetlands,” Mr Nannup said this week. Glen Kelly, who’s usually CEO but is on holidays, has previously flagged the organisation will refer the matter to the federal minister for Aboriginal affairs if the state approves the highway. Lynn MacLaren says the one-hole revelation should render Mr Collier’s decision invalid. “I am gobsmacked by the inadequate level of examination of the site by DAA heritage officers,” she says. She agrees with Prof Dortch the main issue is the decision to ignore SWALSC’s advice about the mythological importance of the site. • about 1000 people turned out to the anti Perth Freight Link rally at Stirling Bridge last weekend. Organisers say the more people learn about the plan, the less they like it.